The St. Mary's Conference of the Society of St. Vincent de Paul is excited to announce its 24th annual collection of back-to-school supplies to help children prepare for a wonderful school year. If you would like to participate, please buy a school backpack, and fill it with back to school supplies. Please label the backpack either Grades K-3, Grades 4-5, Grades 6-8, or Grades 9-12. The backpacks should not be specific for either a boy or a girl. 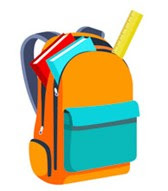 The backpacks may be dropped off inside the front of the church in the designated boxes on the weekend of August 18/19 and on Monday, (August 20th) until noon. Members of the St. Vincent de Paul Society will be distributing backpacks to families in town with school-aged children starting on Tuesday, August 21st. We are also hoping to have enough backpacks to offer them to families living in area shelters. Last year, 133 children and teens benefited from your generosity. It is so important for children and youth to see the goodness in the world. Thank you in advance for your participation in this year’s drive!